This scene from Genesis resembles my house. Partly because my house shows the signs of scarcely holding together over a writhing sea of chaos. Also it has terrible lighting (all my visitors notice this). And then there are the blank canvases. Why paint fabric? Or tape measures? Actual sewing only occurs occasionally in my house – most of my sewing projects are in perpetual stasis. When I pull a bolt from my store of fabric it’s usually to paint it. The raw material is symbolic of the moment before creation. And being symbol, it is what it represents. What are these ‘lengths’ of ‘material’ if not formless voids of measureless depth? Formless void, meet tape measure. 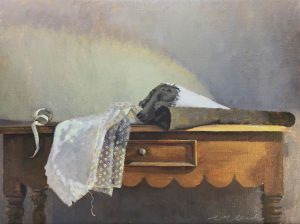 This sort of control over creation is what I have in mind as I arrange my still life paintings. Textiles and creative spaces are beautiful in themselves but also rich with historical, literary and symbolic meaning. 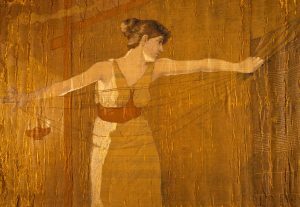 By perpetuating the moment of creation Penelope (faithful wife to Odysseus) was able to keep her suitors at bay for three years – promising to choose a new husband when she had finished weaving her father-in-law’s eventual funeral shroud. This she worked at all day, and at night secretly unravelled. Amazingly – perhaps mesmerised by the skill and beauty the shroud-in-progress displayed – the suitors fell for it. In scripture, torn garments represent grief and death. The Jewish high priest wore a seamless garment; at the crucifixion of Christ, four soldiers ‘cast lots’ for such a robe. Samuel’s mother Hannah made a ‘little robe’ each year for the growing boy she had dedicated to God. She brought it to him on her annual visit to the Temple. There is a recurring ‘scarlet thread’ throughout the old testament — scarlet of course is the colour of blood. Thread symbolised life to the Ancient Greeks too. The Fates spun, measured and snipped it. In the hands of an expert weaver it had dramatic consequences: Arachne was turned into a spider because she bested Athena in a weaving contest. From Vermeer’s lace maker to the ever present distaff, the textile arts represented in art in more recent centuries are frequently symbols for duty, female virtue and harmonious homes. Except where the distaff is wielded as a weapon, in which case the homes are not so harmonious. Paintings from my new collection of work will be on show at the new Lethbridge gallery at Bulimba in Brisbane from 2 March.